**First time ever! 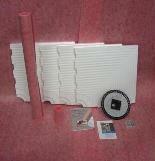 Shower Tray Extensions available Outside of the "Kit Unit" Click Here! 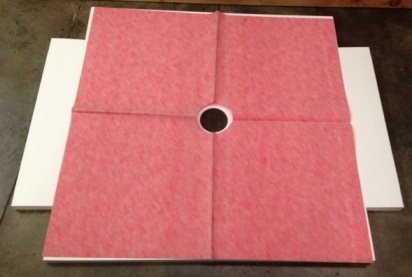 ** ProVa-Mat Is The Premier Waterproofing Membrane for Ceramic tile and can be laid right over Drywall Plywood,OSB,and is waterproof so it takes the place of Kerdi for showers and bathroom tub surrounds. 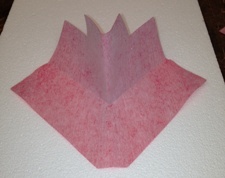 The ProVa-Mat inherits the same principals as the Schluters Kerdi and is much Cheaper. ProVa Systems products carry a full 25 year warranty. >>>> Schluters Kerdi only carries a 5 year warranty. 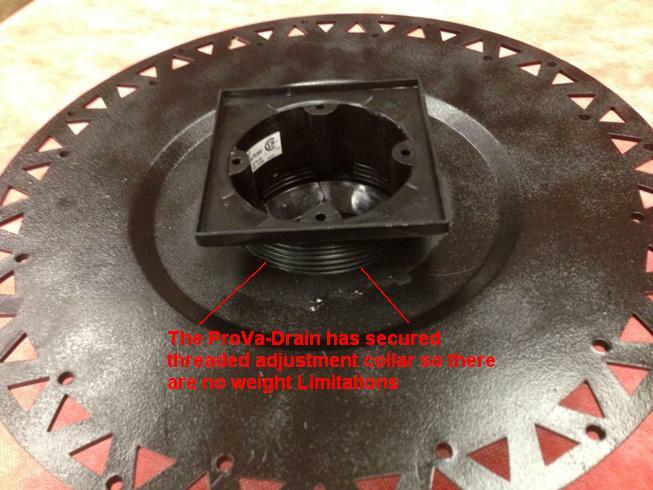 The Drain collar on the ProVa-Drain is threaded, this stops any weight limitations. 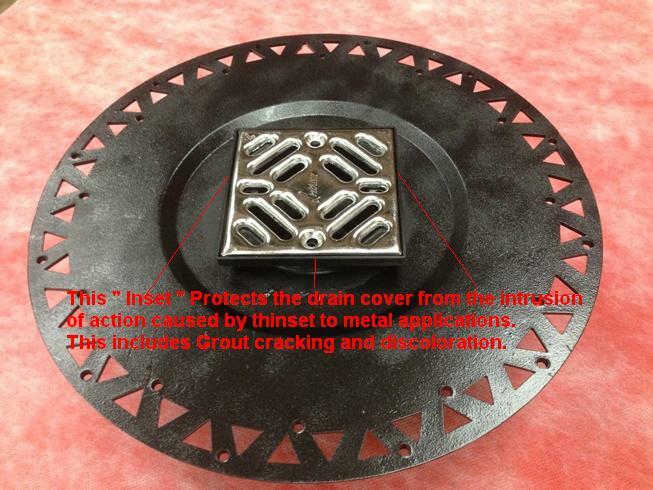 The inset developed by Loxcreen protects the drain cover. 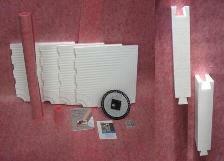 Read my latest instructional blog on Shower System installation: How to install a Ceramic Tile Shower Prep kit. 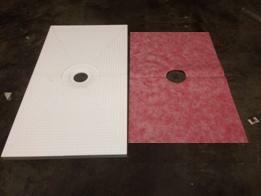 ProVa Mat the Kerdi Alternative As you all know here on My Website we have been selling Ceramic Tile Preparation Install Kits and Ceramic tile Underlayments for many years. We have argued with the the bravest and boldest to bring our point to you. In that point I deal truthfully and honestly based on my 30 years as an installer. You look into my face and you decide who know best, a hands on installer or marketing company. Let me tell you about Waterproofing Membranes.... Many years ago there was only player in the game was the orange stuff Schluter Systems, they revolutionized the Tile Installation industry by creating a Waterproofing Membrane that could take the place of any backerboards and changed the way we installed tile, however..... They did not keep up with the times. They use outdated install advice based on what Thinsets used to be. The still perpetrate their false information to drive the masses to their products. They engaged in harrasment of anybody that disagreed with their ideas even those they used were based on bad science and outdated procedures. The bad science Schluter introduced was that latex modified thinset would not dry when placed between two impervious layers IE: Tile & Membrane...This all sounds good, however there has not been latex in thinset for many years, it is all Acrylics and Polymers these need no introduction of air to "dry", the term dry is what they use but the correct term is "cure". 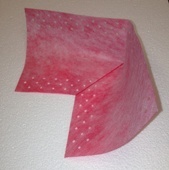 Modified thinsets will not only cure in this enviroment they will cure stronger, more flexible and longer life sustaining then unmodifed thinsets. The Schluter System then decided that their science was not so good and they developed their own thinset called DitraSet, this thinset is what they call "Slightly Modified"....Now I am no science major but the laws of physics tells me that when Polymers and Acrylics are put into thinset it becomes Modified, now the level of modified can vary, when thinset has low modified value we call it junk... it is thinset we are not willing to install tile with as it is unstable. This product they sell retails at about $28.00 per bag while what we consider equal low grade thinset retails at $7-9.00 per bag, yet unless you use their thinset or a generic unmodifed thinset, you have no warranty.... I smell a rat.....Don't you? Necessity is the mother of invention: Loxcreen a Canadian Company looked and evaluated the Waterproofing Membranes on the market they then with the highest regard to Research and Development created thier own product: ProVa-Mat.... they used the best ideas they could find and made a better product, not only was it better it could be installed with Modified Thinset. We have been selling thier products for several years with premier results. I can use Modified Thinset again and I have no worries about the membrane falling off the wall as it did with the Kerdi. 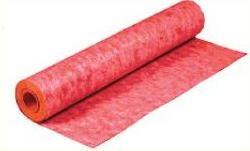 We have sold 100,000s of thousands of Sq Ft of ProVa-Mat over the years, our first format was Ebay, we were harrased by lawyers from Schluter Systems. They removed my items claiming false ownership (that was the only way they could remove it). We moved it all to our exterior websites that the Orange people could not control with lies and deceit and the truth opend like a beautiful flower on a spring day. If you have an odd size shower please CONTACT US for your specialized quote. 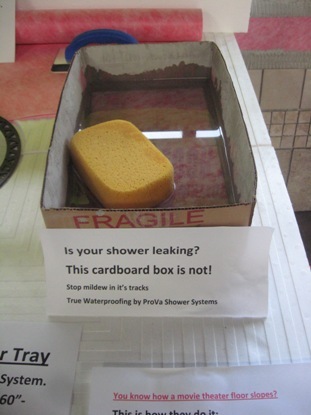 or.. send a fax of your shower diagram to 812-288-7798. 1 48"x 48" Presloped Polystyrene Shower Tray. 108 sq foot; The total of Waterproofing Membrane amounts. 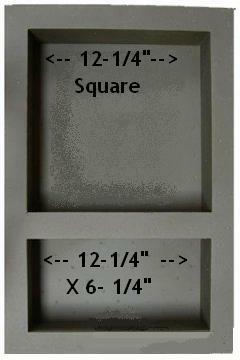 Total Sq Footage of coverage: 108 Sq Ft.
24"x6"x4" for a 48" Curb. 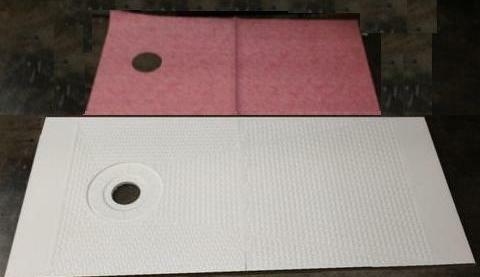 The total of Waterproofing Membrane amounts. 2 6"x32" Presloped Tray Extensions. 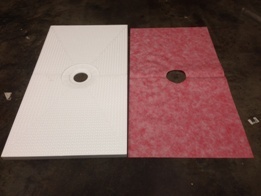 Polystyrene Dovetailed Curbs: 24"x6"x4" for a 60" Curb. 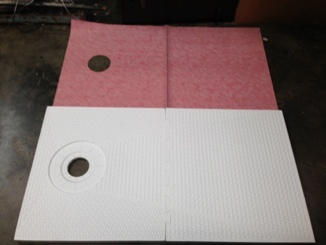 Polystyrene Dovetailed Curbs: 24"x6"x4" for a 72" Curb. 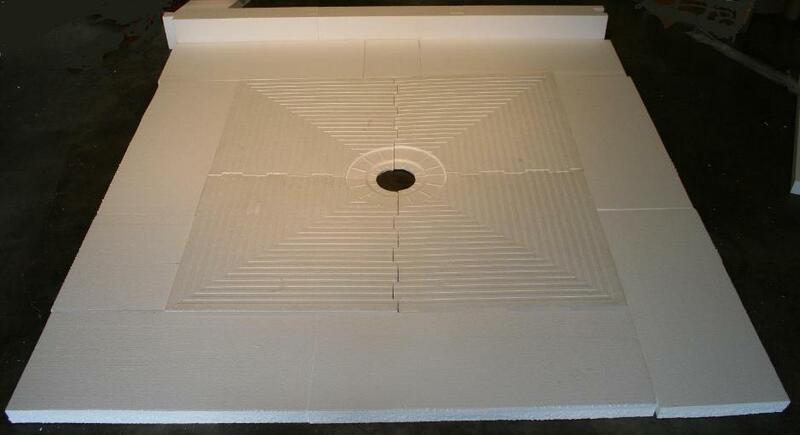 1 32"x60" Presloped Polystyrene Shower Tray w/drain hole at 10" from end. Total Sq Footage of coverage: 105 Sq Ft.
6"x32" (2 Pcs)Presloped Tray Extensions. 6"x 60" (3 Pcs) Presloped Tray Extensions. 2 24"x32" Presloped Tray Extensions. Polystyrene Dovetailed Curbs: 24"x6"x4" for a 96" Curb. 2 6"x48" Presloped Tray Extensions. 2 12"x48" Presloped Tray Extensions. 2 24"x48" Presloped Tray Extensions. 1 12"x48" Presloped Tray Extensions. 5 6"x48" Presloped Tray Extensions. 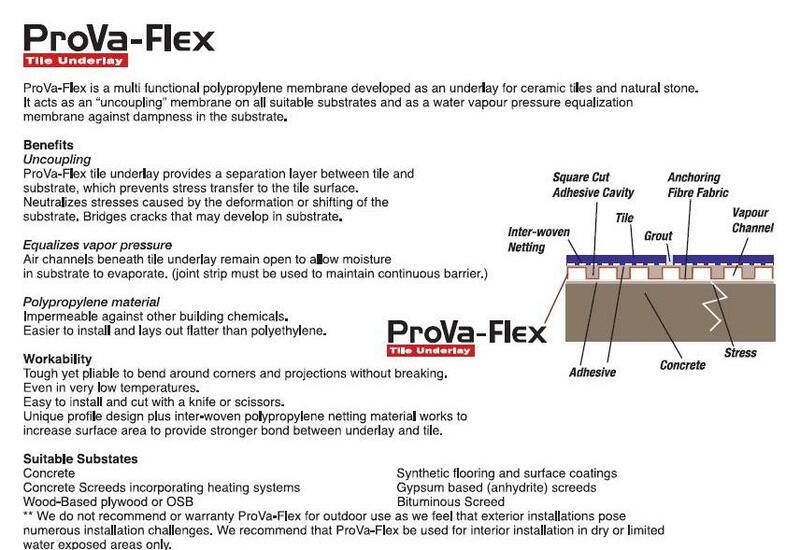 Total Sq Footage of coverage: 150 Sq Ft.
Total Sq Footage of coverage: 235 Sq Ft.
Total Sq Footage of coverage: 285 Sq Ft.
ProvaFlex is a polyethylene membrane with a grid structure of routered, cavities and an anchoring fleece laminated to its underside. 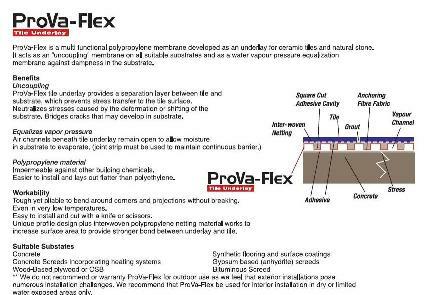 ProvaFlex forms an uncoupling, waterproofing, and vapor pressure equalization layer. 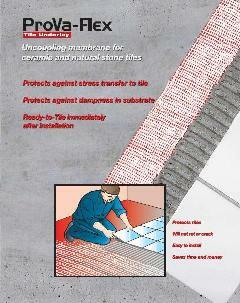 Designed for ceramic tile and dimension stone installations. 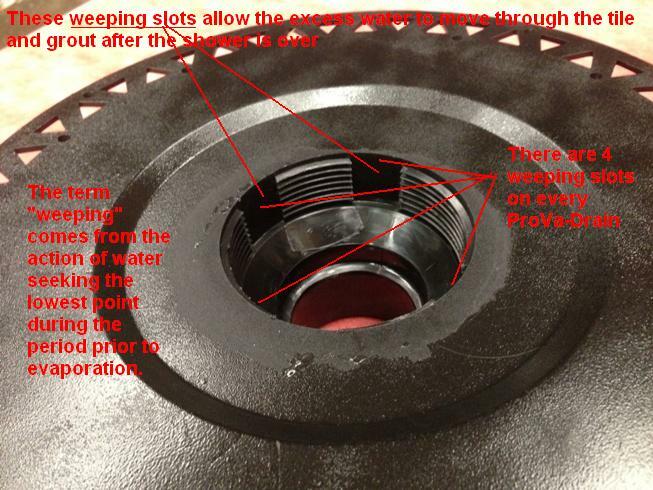 and a vapor pressure equalization layer to accommodate moisture occurring at the underside of the substrate. 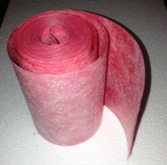 To bond ProvaFlex , use a bonding mortar that is appropriate for the substrate. 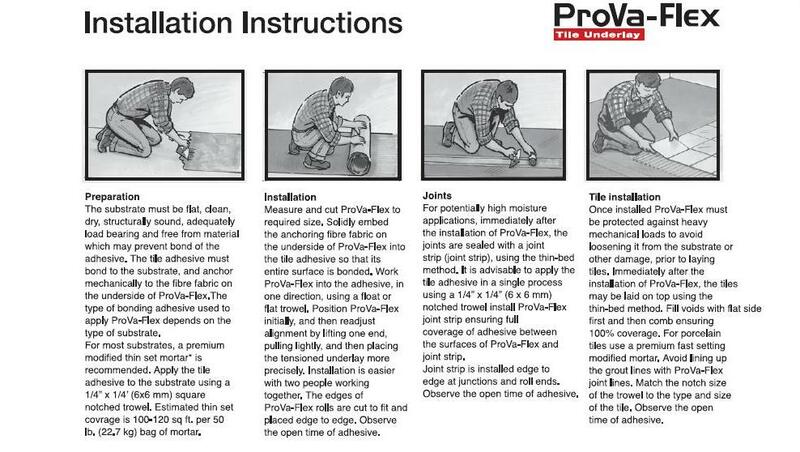 Apply the mortar using a 1/4" x 3/16" (6 mm x 4.5 mm) V-notched trowel. 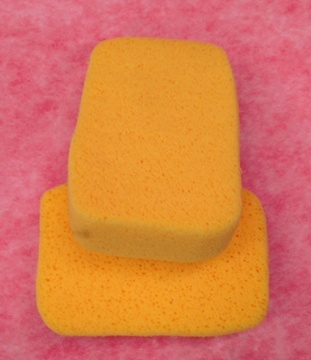 The anchoring fleece on the underside of ProvaFlex must be fully engaged in the mortar to provide a mechanical bond to the substrate. 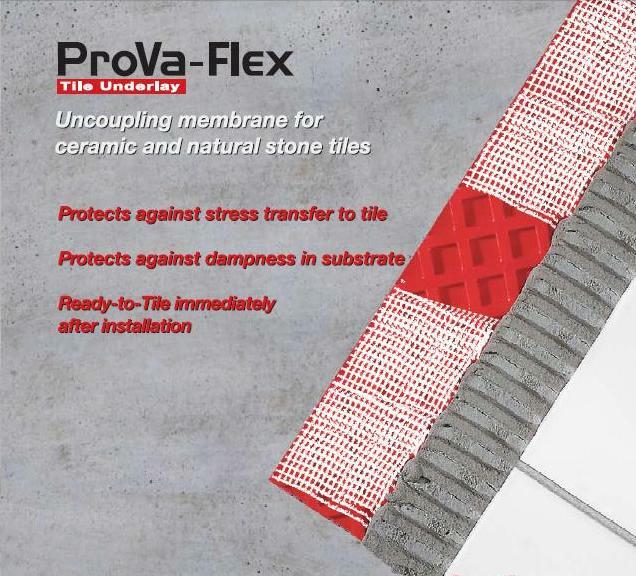 Using the thin-bed method, set the tile covering directly on the ProvaFlex in such a way that the tile adhesive becomes mechanically anchored in the square mesh covered cavities of the ProvaFlex matting.